The Manitoba Food History Project exists to answer two research questions: How has food been produced, purchased, and consumed in Manitoba? How have those processes changed over time? 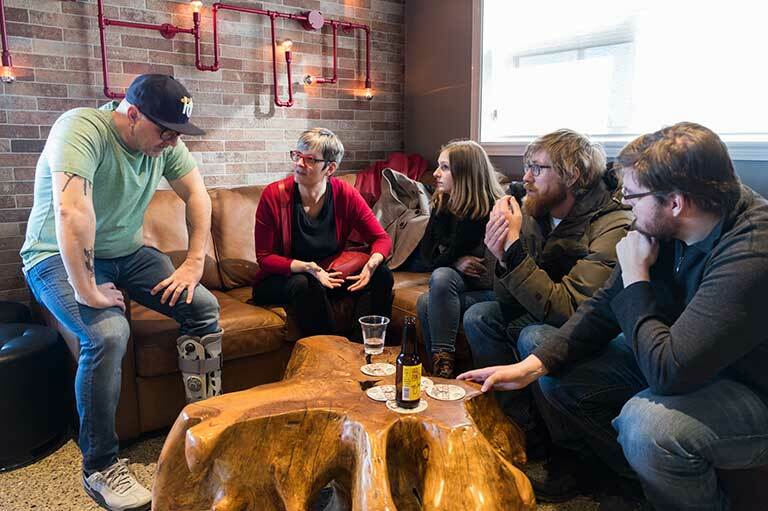 Professor Janis Thiessen and students in the Half Pints taproom for a tour. History students and faculty members at the University of Winnipeg are conducting oral history interviews and producing digital history projects. This work is funded by the Social Sciences and Humanities Research Council of Canada and the University of Winnipeg, in partnership with the Oral History Centre and Diversity Foods. Our findings will be published in a variety of formats: oral history interviews archived at the Oral History Centre at the University of Winnipeg, podcast episodes, digital maps, pop-up exhibits and public events, and (eventually) a Food History Truck cookbook. As students in Professor Janis Thiessen’s Advanced Studies in Canadian Social History class, the four of us focused on food history and how it related to social history in Canada. We used oral history as a way to understand the retention of food traditions. In addition to traditional course readings and discussions, we prepared dishes that connected to our learning, and took field trips to local food producers. In the course, we learned how food history connects to all disciplines and provides an important perspective that is often ignored. The goal of the course was to conduct an oral history interview and use it to produce a podcast or a digital map for The Manitoba Food History Project website. Jackson Anderson interviewed José Barrera about his experiences as a Salvadoran Canadian in making and adapting salsa and other Salvadoran foods in the Manitoban cultural mosaic. José’s life story, and the insights he provided, show the challenges that Salvadorans and other recent migrant communities face in adapting to Manitoba’s multicultural landscape while preserving their distinct foods and cultures. Brendan Dvorak interviewed Travis Boyd of Winnipeg’s Black Pearl Coffee. Brendan used that interview to create a digital map exploring big box stores, European-style shopping, and the ‘food desert’ that is the North End of Winnipeg. Zachary Hamilton investigated the mystery of why Winnipeg has such a high number of independent Greek burger joints. He interviewed Winnipeg’s burger king, John Ginakes – founder of Winnipeg institutions like Thunderbird Restaurant and Johnny G’s. Zach created a podcast based on this interview. Madison Herget-Schmidt interviewed Dilla Narfason, an Icelandic woman who illustrated the importance of preserving traditional Icelandic foodways in Gimli, Manitoba. Dilla’s life story illustrated the experiences of Icelanders and other immigrant groups in Canada, and the process of preserving culture and traditional foodways upon moving to a new country. We were assisted in our work by the staff of the University of Winnipeg’s Oral History Centre. Kent Davies used his years of experience in radio and audio storytelling to teach us the art of podcasting, interview recording, and field recording. Kimberley Moore brought her experience as an oral historian and as program coordinator at the Oral History Centre to assist us with the process of conducting an oral history interview, creating digital maps, and digital storytelling. In addition, Sarah Story, an oral historian, shared her experiences in conducting oral history projects to assist us behind the scenes, guiding us through the interview and post-interview process. We sincerely thank everyone who has helped us throughout this journey! A mistake cost the Oilers the Stanley Cup, but did not destroy the man who made it. A collection of Canadian modernist painters brought abstract expressionism to a city and country that often didn’t want to see it.